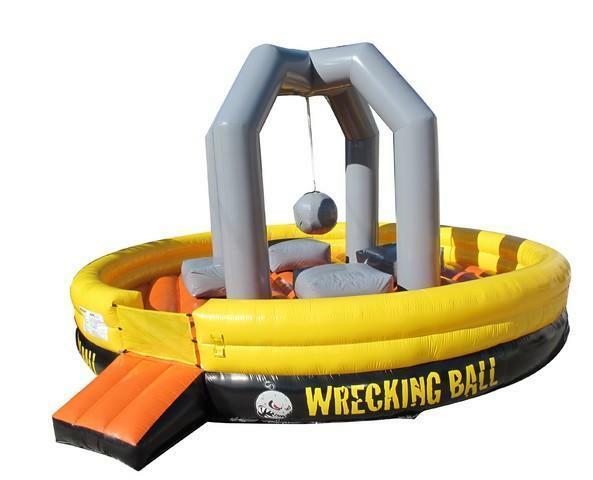 This Wrecking Ball inflatable game is an awesome game for kids, teens, and even adults It's extreme and hours of wrecking ball fun! With this game, players stand on their individual pedestasl and try to throw the huge swinging padded ball at each other to knock their competors off their pedestal. The pedestals they are standing on are inflatated and can be a bit unsteady. That unsteadiness will sometimes cause the participants to fall of their pedestal when they just merely try to return the swinging ball to their competitor. Wrecking Ball is the Ultimate game of challenge, balance, and competition for (4) Players at a time as they each stand on their inflated pedestals trying to balance and at the same time battling to grab the Wrecking Ball and hurl it at back at their opponent in an attempt to knock the player off of their inflated pedestal. As the ball swings back, try and grab it! The last player standing is the champ. This game is a 28' X 28' round. It is recommended for ages 5 to adult. It is sometimes hard to find a game that teens and adults can play as well that will offer a challenge and fun for them. The Wrecking Ball offers just that type of fun. It is perfect game for corporate parties, school events, after proms, project graduations, church youth groups, and community and city festivals. The Wrecking Ball Game will create the hype that you need to make your event the best event ever. 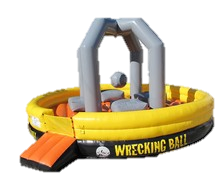 To reserve the Wrecking Ball for your next event, click on the add to cart button below and then select your date and times, and simply follow the directions to complete your order and pay your deposit. Your paid deposit goes directly to the rental price and it is subtracted from the total and not in addition to the total rental price. If you do not like to place reservations online, please do not hesitate contact us and we will do the booking of Wrecking ball for you and take your deposit over the phone. We are always readily available and happy to assist our customers in any way we can. Do you have to what it takes to play Wrecking Ball?